Renaissance Dad just turned two. It has been a wonderful two years of watching my kids grow, learning new skills, gardening, building, cooking, and writing. 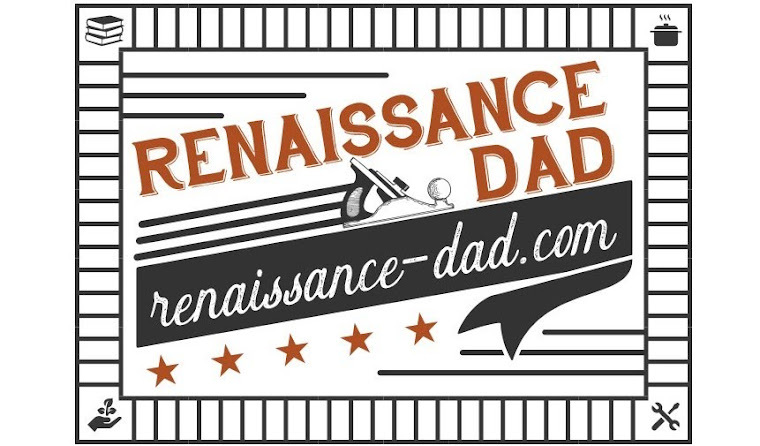 I so appreciate all of the people who have supported Renaissance Dad by reading and sharing. Here's a look back at the last two years with the first paragraph from some highlighted posts, along with links to continue reading them. "This school year marks my 14th year in education. I have been a teacher, a curriculum writer, a coach, an Athletic Director, an Assistant Principal, a Principal, a Director, a Head of School. Basically, if it needs to be done in a school, I have done it. Yes, I have even filled in as a crossing guard and a janitor from time to time. Every year, as the school year starts off, I feel like one of my biggest jobs is to bridge the gap between school and home. When two groups of people as passionate about their jobs as teachers and parents are come together, it can feel like clash of the Titans. 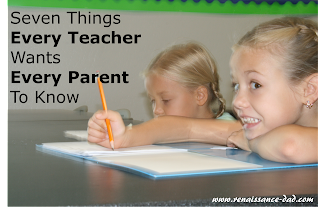 That's why I decided to share my list of Seven Things that Every Teacher Wants Every Parent to Know." (read the rest of the article here). "I had to say goodbye to an old friend yesterday. It was really sad. I have known this friend for 14 years. We met at my birthday party in 2000, and since then, we have spent almost every major holiday together. We typically got together 3 times per week. 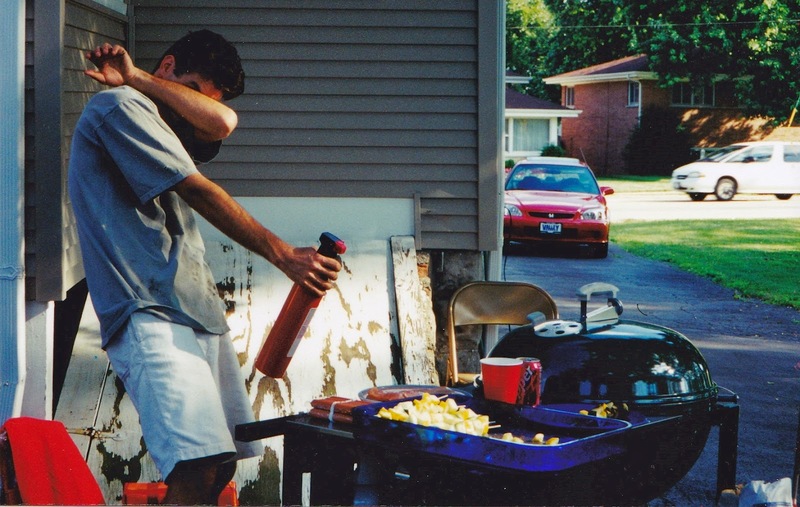 Whenever people came to the house, this friend was there, and was almost always the center of the party. I will miss this friend. I actually wept when I had to say goodbye, and as I write this now I am getting somewhat choked up. This friend was my Weber Performer grill. And no, I'm not joking about getting choked up." (read the rest of the article here). "Okay, I know that in my last post I promised a two part post about new tools, but this one is too good to pass up. I also know that a lot of my posts make "life changing" claims, from Limoncello to fall beverages, from Italian Feast to Lemon Pound Cake. But this, my friends, just may top them all. It is simple, takes merely four ingredients and a few minutes to make, and will cause your wife to want to get lovey-dovey no matter what kind of day she's had. Here is one of the simplest, most amazing desserts you will ever, and I mean EVER, make." (read the rest of the article here). "April is Autism Awareness month. 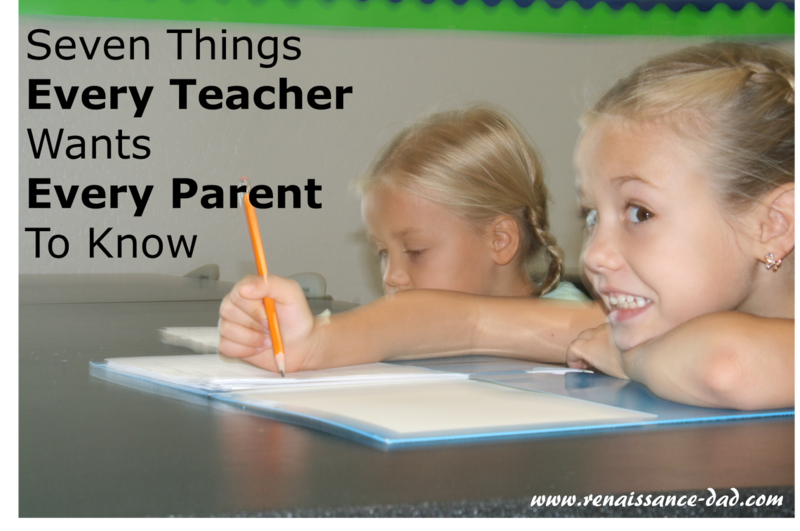 I was asked to guest blog on my experiences as an educator. 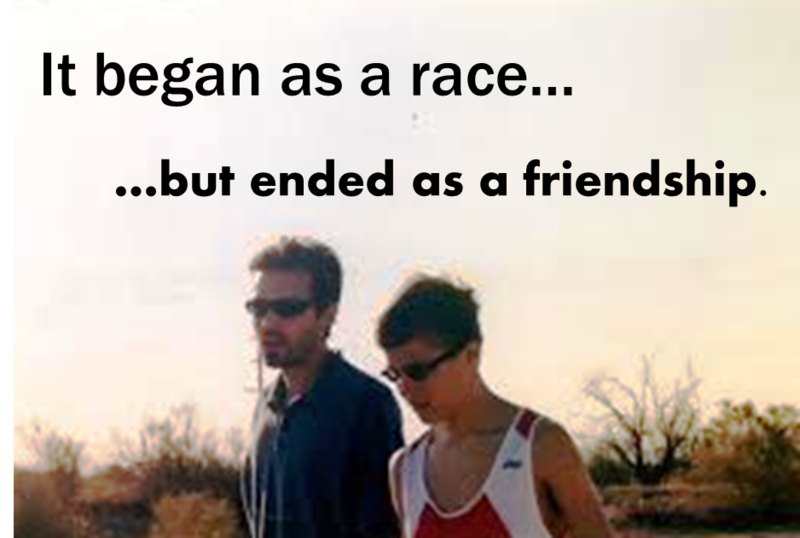 I chose to write about my experiences with a student who became such a delight to have in class, on the stage, and as a runner." (read the rest of the article here). Thank you, dear reader, for making it so much fun to write over the past two years. Here's to many more years of building, gardening, cooking, and raising kids in hopes of not screwing them up too much! Two years ago my mother-in-law bought my then five-year-old a two wheel bike. Big E hadn't learned to ride a two wheel bike yet, so I took this as the perfect opportunity to get her going. I envisioned taking her to the park, starting her in the short grass, having her ride up and down the field while daddy jogged alongside of her - basically I would have her riding a bike in ten minutes, maybe fifteen tops. Two skinned knees, torn leggings, and a few tears later, I was carrying the blasted two wheel bike and my daughter home. Once I stopped crying, we tried again the next day. And the next day, and the next day. We were not progressing, so I talked with a friend of mine who worked in a bike shop for years, and he said that kids are ready for two wheels at different times. I figured that maybe Big E wasn't quite ready for two wheels, but this bike didn't have any training wheels. I jumped on Amazon and found some inexpensive, somewhat well rated, aftermarket training wheels. So the new plan was to put the training wheels on, leaving them slightly off the ground, to help Big E with her balance. 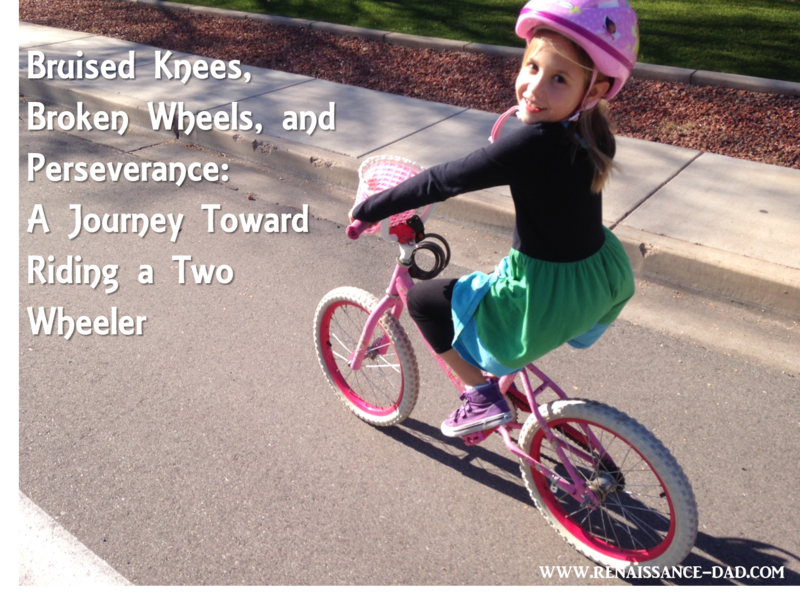 She would get the hang of balancing on two wheels and only use the training wheels on tight corners. She would be on two wheels in two weeks. Three weeks tops. She rode the tar out of those wheels. They got so bent up that her bike would turn on its own because of the angle of the training wheels. I was so frustrated with the wheels, their cheapness, their poor quality. I was ready to blast them with a review on Amazon. And then I realized something. The poor quality caused the wheels to bend. The bend caused the bike to pull and slow down. This caused Big E to try to avoid the pulling and slowing down, which caused her to balance, which caused her to learn to ride a bike on her own. So last November, we decided to take the training wheels off. Big E and I went to the park, and with zero help from Daddy, she started riding laps around the park. No running, no skinned knees, no training wheels. Nothing but huge smiles from Daddy and daughter. And yes, daddy did shed a small tear that day, because I realized that my little girl is growing up. A two wheel bike means independence. But that independence was earned with the perseverance that Big E showed in her refusal to let cheap training wheels slow her down. Independence earned with perseverance. That's a life lesson that I can definitely hold onto. The idea of cold tomato soup never quite appealed to me. I pictured in my mind a frosty can of condensed, gelatinous sludge. Gross. But when I studied in Spain, my host family made gazpacho. Being the courteous young man that I was, I went to Spain planning on trying everything at least once (this only backfired one time when I ate a slice of pickled pigs cheek, which was as disgusting as it sounds. No offense to anybody who likes pickled pigs cheek). So as I took the first bite of gazpacho, I had low expectations. But boy was it delicious. I was sold, and upon returning to the States, I started making gazpacho for anybody I could convince to try it. Over the years we have modified our gazpacho recipe. The greatest thing about gazpacho is that it is so easy to make and you can adjust the ingredients according to your tastes. So here is the "recipe" for gazpacho (recipe in quotes because we usually don't measure anything out). Put all ingredients in a blender and blend until smooth. My Spanish family ran the gazpacho through a food mill before serving, but I prefer the pulpy goodness. Garnish with some avocado slices, cilantro, or hot peppers (I like to sprinkle a couple of piquins in my gazpacho to add a little kick). 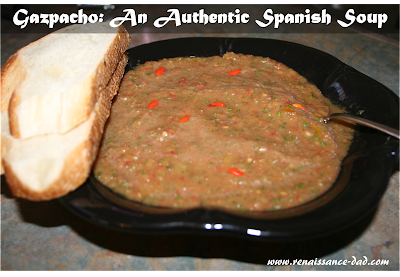 Bake up some artisan bread to go with this and you've got a complete, authentically Spanish, easy meal!